I know, I know. My French toast model is GORGEOUS. 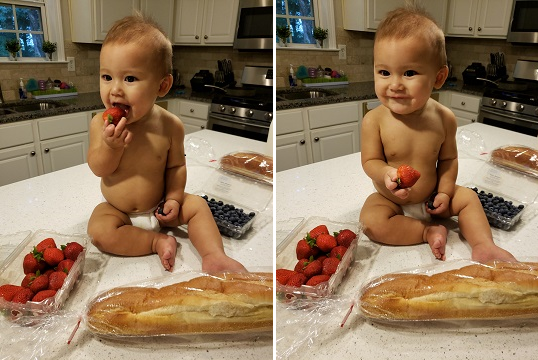 This was right before she decided to smear the strawberry into our WHITE quartz counter top. Luckily, Daddy is best friends with 409. Not sure if you’re supposed to use 409 on counter tops but we literally use it FOR EVERYTHING. The other day, Mila (pictured and also our 9 month old daughter) and I decided to make this French Toast we found on Pinterest (link to my boards down below). We followed the recipe step by step but added some strawberries to it. WHEN I TELL YOU THIS STUFF IS AMAZING… I’m not joking y’all. It is literally the most heavenly French Toast I have ever made and my family cannot live without having it at least twice a month. Check it out for yourself and let me know if you added your own little flair to it! Who is The New Mom on the Block? Thank you! I am learning to add more of myself and my emotion into it! I don’t have any videos!! But thank you for the feedback! I will definitely write more and hope you come back to enjoy it! website and in depth information you provide. It’s good to come across a blog every once in a while that isn’t the same outdated rehashed information. Thank you! I am so glad you are enjoying it! I am looking forward to putting out more content more often! Thank you so much! I live for simplicity so this layout spoke to me. The layout is one I actually purchased through the themes on Word Press! Hi there!! Thank you so much!